A new puppy can bring oodles of joy. But the little guy can also try your patience. Arguably, this latter aspect is most evident when you're trying to teach him to sleep throughout the night. It’s an issue that can be resolved rather efficiently, with the help of some training. In order to appreciate why your puppy may whine, cry, or yelp throughout the night the first few weeks he’s in your home, you have to understand things from his point of view. First and foremost, while you’re welcoming the young pooch as a member of your family, these are the first days away from his mother and siblings. As such, your dog’s behavior is primarily a cocktail consisting of separation anxiety and the fear of a new, big place - one that he has to go alone. When you put these elements into the noggin of a pup that’s just a few weeks old, it’s not all that surprising that he’s going to struggle getting a good night’s rest. When Can I Expect Him to Get Over This Phase? 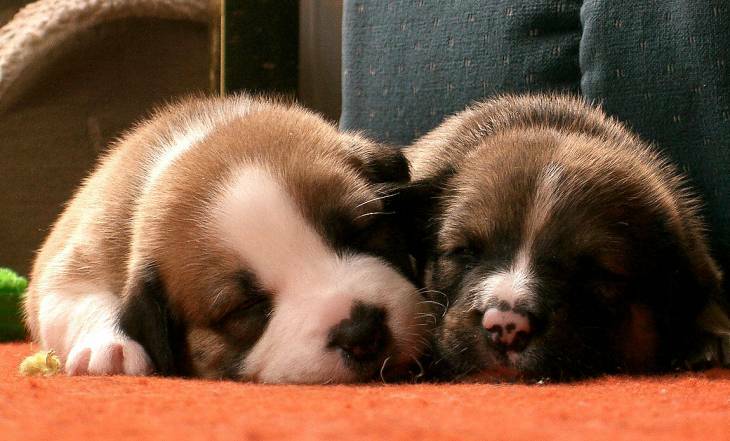 Technically speaking, a puppy will be able to sleep through the night at around the twelve-week mark. However, keep in mind that twelve weeks is also around the time when the pup transitions from a breeder to their permanent home. If you’re getting a pup at around that age, expect to tack on a few extra weeks for adjustment purposes. With that being said, the actual time period as to when he’ll be able to sleep through the night depends rather strongly on how much effort you put into training him to do so. If you remain diligent in this aspect, you’ll be able to get him on a regular sleep schedule quicker. Because your puppy is suffering from separation anxiety, it may be critical to allow him to sleep in your room for those first few weeks. This doesn’t mean allowing him on the bed - ideally, you'll get a crate involved in the process. By letting him share your room, you'll give him a measure of comfort as well as a place to learn certain appropriate behaviors. Do I Have to Keep Him in My Room? It is possible to train your dog to sleep through the night without him being in your room. However, there are a few extra steps you should take if you insist on going this route. Just be mindful that you still won’t be getting any extra sleep by doing so. Firstly, you will want to create a soothing environment for your pup. The best way to do this is to fill the room with sounds that are soothing to him, which can be done through a white noise machine or by leaving on a fan. There is also a ton of music devoted to aiding canine slumber available on the market to consider. Secondly, and perhaps most importantly, you need to make sure your little guy is close enough for you to hear him fidgeting around his crate. This is a tell-tale sign that he needs to “do his business;” an act he should never do in the place he sleeps. If you hear him making a fuss, it’s important that you act on this particular behavior immediately. While it may feel like a chore to get your pup to sleep throughout the night, getting him to that space isn't too difficult as long as you use a little logic. For instance, he shouldn't have food and water before he goes to sleep since doing so will up the chances of him needing to go potty. You should also make sure his sleeping space is as comfy as possible. Eventually, deploying these steps will encourage your pup to get a restful, full night’s sleep. They will also lead you to get a healthy dose of slumber. This fact alone should be all the encouragement you need to properly train your pup until he finally gets the hang of things.